Rome Wasn’t Built In A Day, But Could Your Brand Be? Internet marketing Sherpa Seth Godin describes a brand as the combination of something that predicts what to expect, multiplied by the emotional power of that expectation. Building a magnetic brand is the holy grail of the business world in 2013. Finding that grail may be a bit of an expedition, but it’s certainly a journey worth taking. 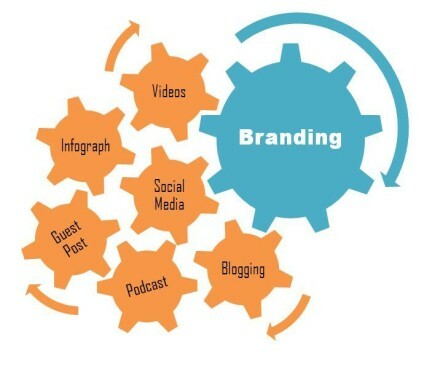 To build the ultimate online presence for your brand, a multi-pronged approach is essential. Branding expert David Brier reminds us that branding requires a very broad strategy, and attacking just one point most likely won’t allow your brand to stand out to its full potential. That’s why juggling the major pillars of online brand management is a foundational part of getting recognition, sales and growth. Once you have established your mission statement, “about us,” logos, profiles and site copy, it’s time to create your social media pages. They should be a reflection of your brand, but kept lighter and more conversational than your site. Depending on who your demographic/target audience is, spend some time learning about them. Build Out Your Plan: Maintaining your social media presence is like making sure your suit is ironed and your tie is on straight in the business world— it’s not going to directly cause your success, but mismanaging it or ignoring it can make you look unkempt and lower your respectability and reliability. Think about the best ways to engage your audience, ask them questions, and stand out amidst a world of advertising mayhem. Consider an Aggregate Service: Managing all of your social media pages can be a job in and of itself. Twitter, Facebook, LinkedIn, your blog…it can all get daunting and take away from time spent growing your business. That’s why it can be very fruitful to consider a social media aggregation service like Sprout Social or Vertical Response, which both allow you to plan out your social media posts months in advance, while still tailoring them to trends and current events. Taking Godin’s advice, once you’ve begun building and expanding your empire, make sure that your message(s) stays consistent with your mission statement. Nobody wants to be the schizophrenic of the business world, and mismatching the tones, topics and content you put out will have that effect. Ensuring your reputation is ironclad and consistent is the key to taking the Internet by storm. An effective content and SEO strategy is key to making sure your customers are seeing your positive side. If you need help accentuating the positive, companies like Reputation.com can help. Thinking big is the best way to be big, and big brands don’t usually happen by accident. They are built on tireless work and relentless strategizing. Ed Roach from Small Business Branding advises that your brand arsenal should have nothing to do with you and everything to do with how your product or service relates to your target market, and their needs and desires. If you do involve yourself in your mission, make your story about how you rose to meet a need, keeping the desires of your target market on the front burner. Being a mix between the little engine that could, tapping into the needs and demands of your target market, and building and maintaining a consistent presence online and off will give you the advantage you need to take your business to new heights.